Thread: Does she look overweight? She wouldn't sit still for a pic. Best I could get for now. She's a year & 3 months in this picture, weighing in at 1542 gr. Re: Does she look overweight? fat usually accumulates in the lower third of a snake's body. a better body pic will help, but i will say she's definitely a well-fed female. I think she looks awesome! Well, she's not thin... Another way to judge is that snake scales are supposed to over-lap. If you're seeing skin between the scales, then yes, she's overweight. From that one photo & distance, I cannot tell, but you can. Yea, she doesn't "look" overweight to me. But, being my first bp, I wasn't 100% sure. I will try to get a better photo. Regarding the scales, they look healthy and overlap as should be. She looks "solid" to me, & good on you for inviting input. I've seen from your gallery that you have had her since a very young age. You have done a good job with her. If it's possible to tell if a snake is happy then I'd say she looks happy. She's been taken care of for sure. Hope it keeps going well for ya both. She looks like she is a handful. She looks beautiful and healthy to me! It's really tough to tell from that pic. She's definitely a big girl. Based on the lower 1/3rd that Taylor mentioned, she's a bit beefy. And going by that scale suggestion Bogertophis mentioned, it's tough to tell in that pic due to the way her body is turned, but I see some spots with some decent gaps between scales. Again, it's likely the way her body is positioned though. Does she maintain a triangular shape? She looks overweight to me but I do agree with others that it is hard to tell in that photo. 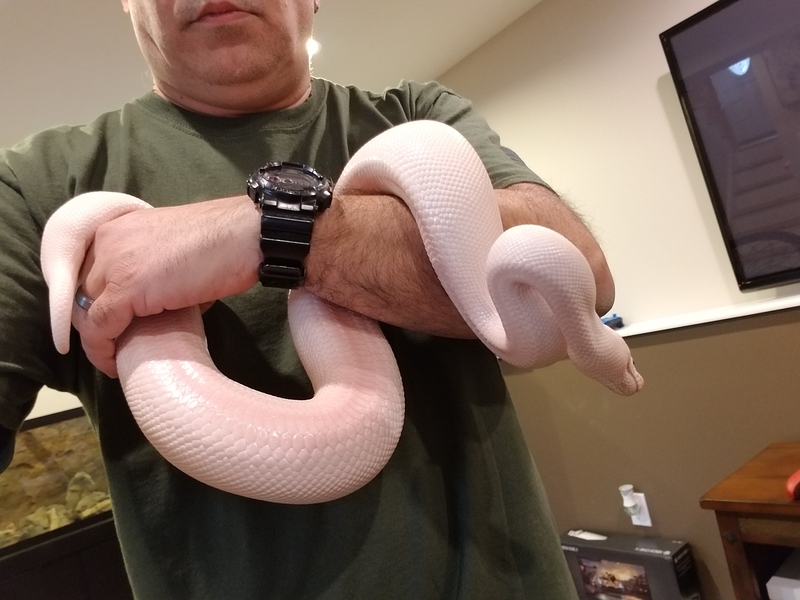 Definitely a wide beefy well fed girl, to be 1500+ grams in one year, but I feed on the more conservative side for sure.